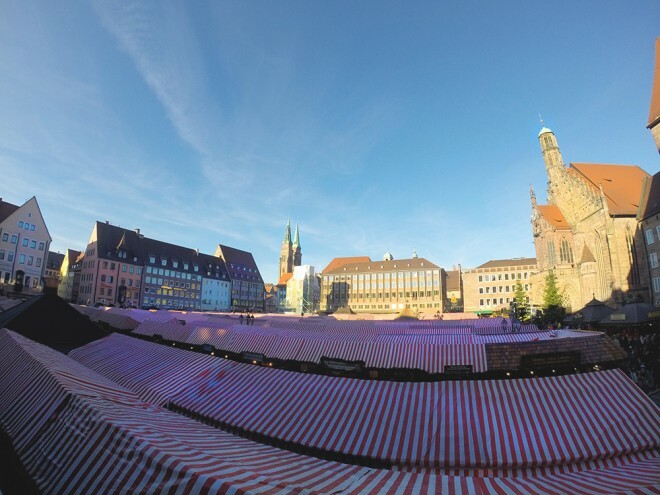 Dated all the way back to the 16th century, the Nuremberg’s Christmas Market, or the Nürnberger Christkindlesmarkt, is one of the oldest in Germany. During the World War II the event didn’t happen, being re established only in 1948 as the old town was destroyed during that period. 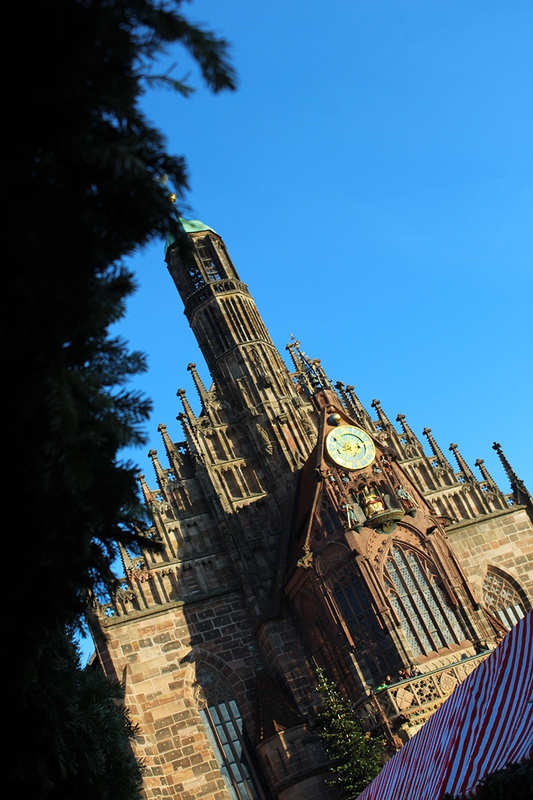 It’s been long since I try to visit the Nuremberg’s Christmas Market, and finally this year I made it there. I was not only impressed with the market, but also with the city itself, as it was my first time there too. 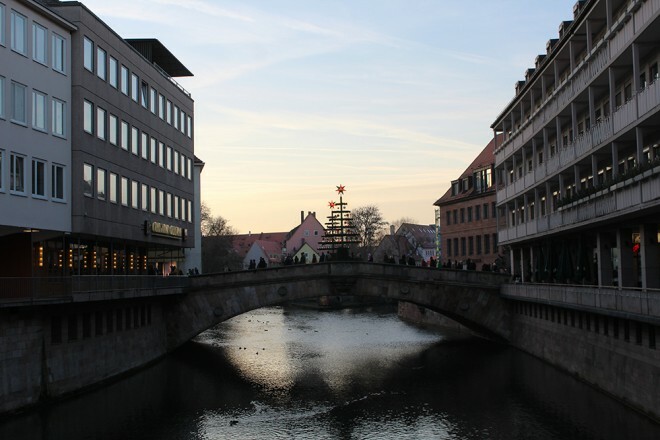 The old town is the perfect scenario for the Christmas Market, there is no way one cannot get into the Christmas mood while there. 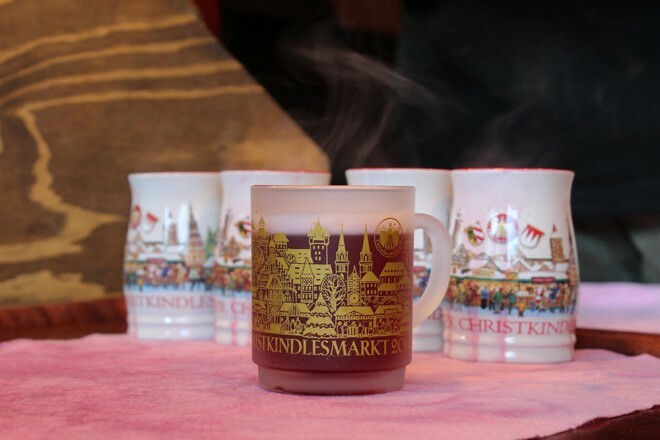 As in every traditional Christmas Market in Germany, this one has mulled wine, actually a variety of them, including blueberry flavour; handcrafts such as board games and Christmas decorations, gingerbread hearts and other shapes, chocolates, fruits covered with chocolates, nuts, clothes, candles, sausages, especially the Nürnberger würst – typical local sausage – concerts, plays, and much more. The difference between this market and the ones I have been so far is: the size is doubled, tripled or maybe more. 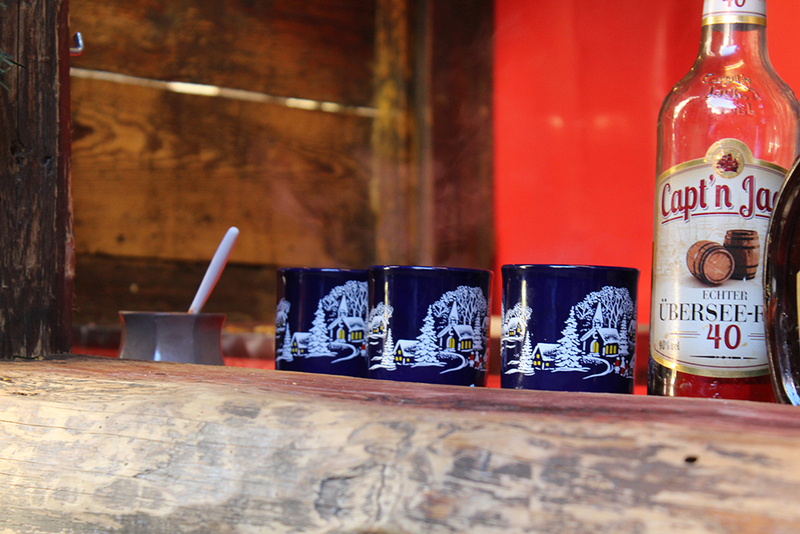 Once it gets busy, you can really get lost among the stalls. 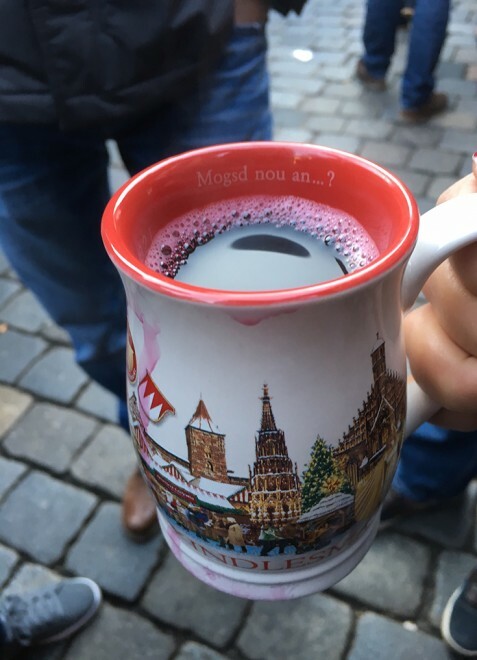 There is certainly enough to keep you busy for hours. 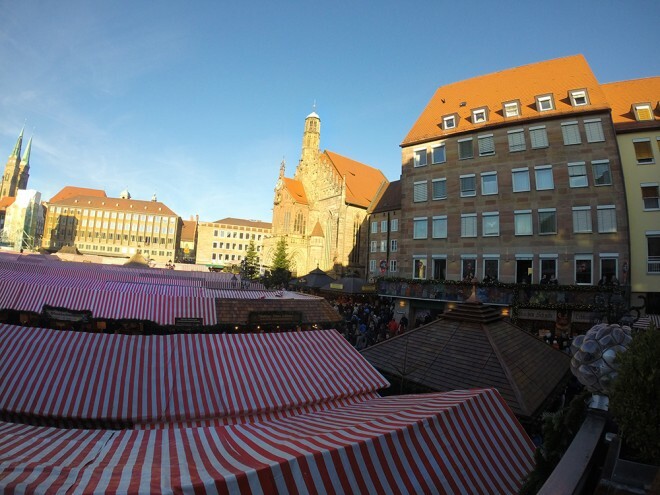 The Christmas Market is located in the Main Market Square, Hauptmarkt Nürnberg, and from there you can take some time to explore the surroundings. 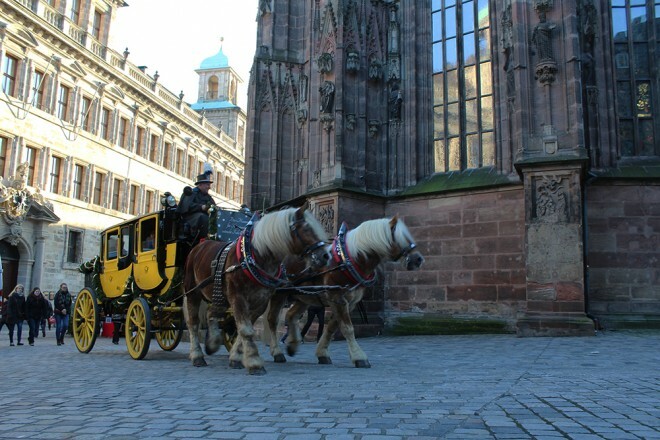 Important landmarks of the city are just a few steps away, like the St. Lorenz Cathedral and the Kaiserburg – Nuremberg’s castle. 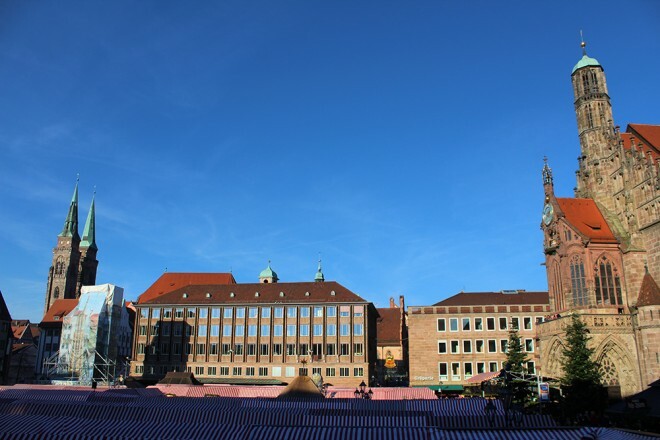 Just across the Hauptbahnhof you will see a medieval tower and gate (Königstor), right there you will find a mini Christmas Market, the Handwerkhof Nürnberg. 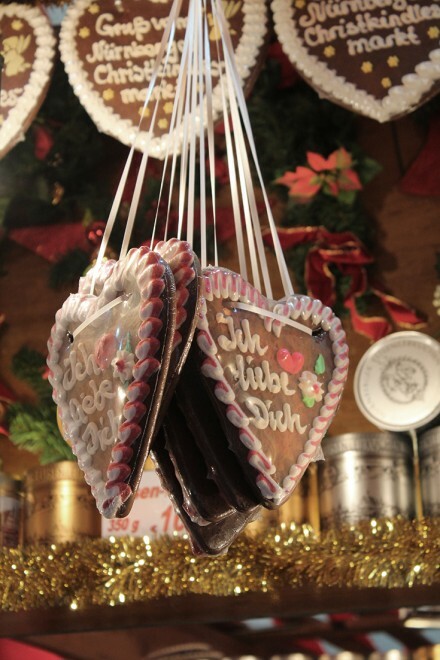 It is basically composed by handcrafters, where it is possible to find jewelry, wooden crafts, clothing accessories and others, but there is also mulled wine and Bratwürstsemmel – sausage and bread. If you think the outside is beautiful, you should enter and see how stunning it is on the inside. 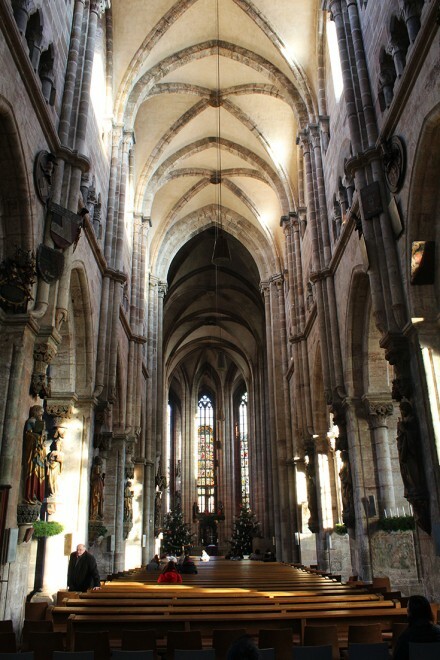 One of the most breath taking cathedrals I have entered so far, certainly worth the visit. 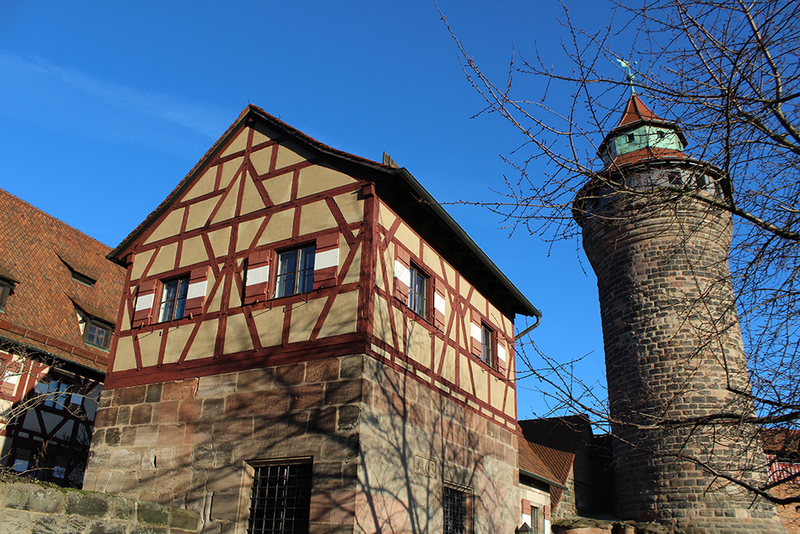 The Kaiserburg is located on a hill, from where you have a great view over town. 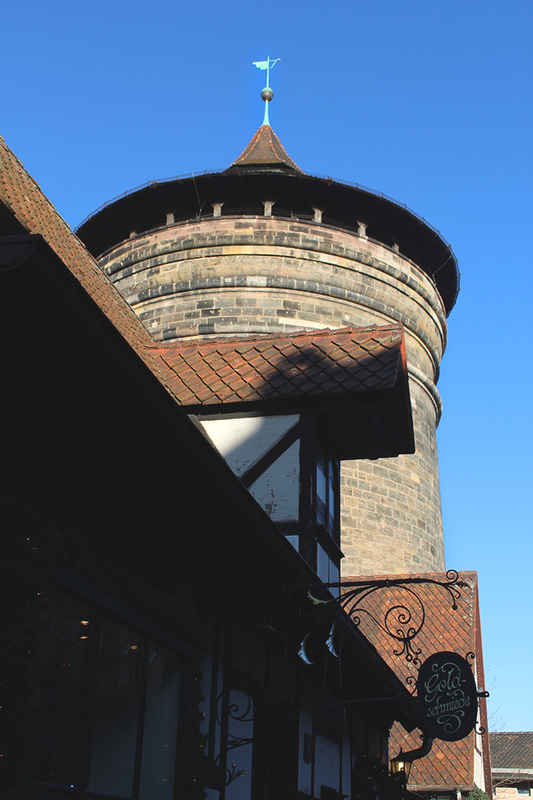 You can walk around its medieval walls and cobbled stoned floors, go up the tower, or simply hang around. 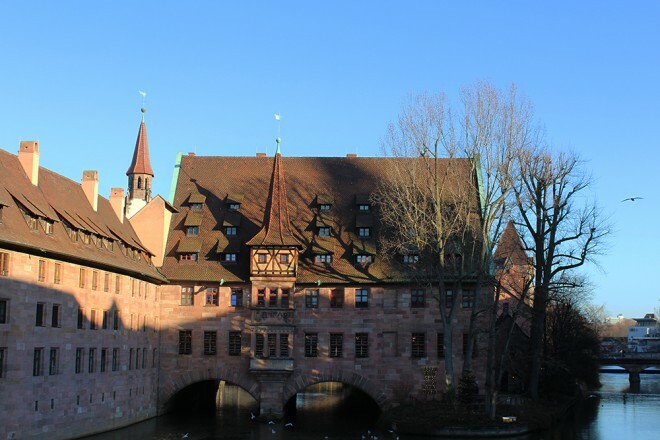 Pegnitz river crosses Nuremberg’s old town and gives an extra charm to it. Small islands can be spotted, cafes and galleries nearby. I never guessed how beautiful Nürnberg is, and I’m glad I know now. The old town with its colourful buildings, cathedrals, cobbled stoned streets, carriages, castles and medieval walls and gates make Nuremberg one of the prettiest German towns I have visited so far. 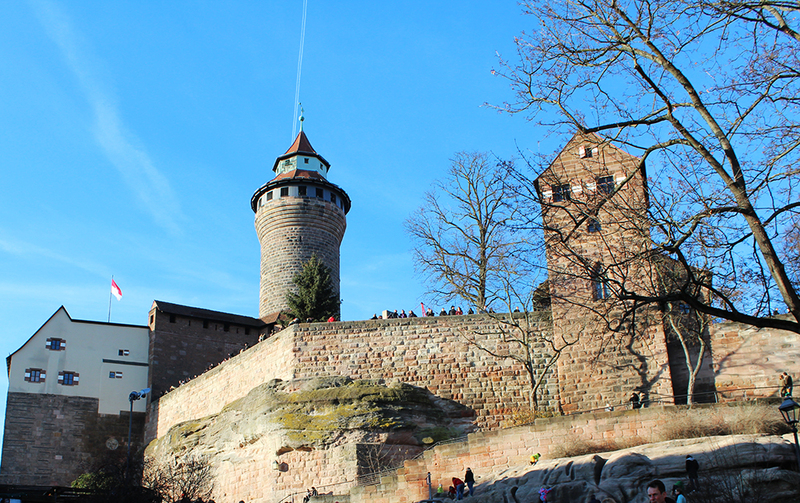 You can easily take a day tour from Munich to Nuremberg; a cheap and nice way to get there is by train. 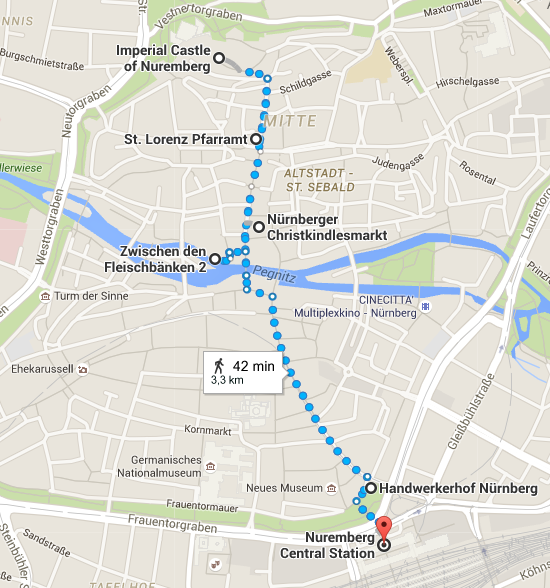 There are several trains leaving from Munich’s Hauptbahnhof throughout the day, and the journey lasts around 2 hours maximum. The Christmas Market starts on the last Friday of November and goes until the 24th of December. It is open daily from 9:00 am to 10:00 pm, and on the last day (Christmas Eve) it closes at 2:00 pm. On the way back, make sure to be early at the train platform, as the train will probably be packed (especially on the weekends). Ohhhh that’s awesome!! I still haven’t been to the Christmas Markets in Berlin, must be awesome! I hope you had a great time 😀 I’m sure you did! 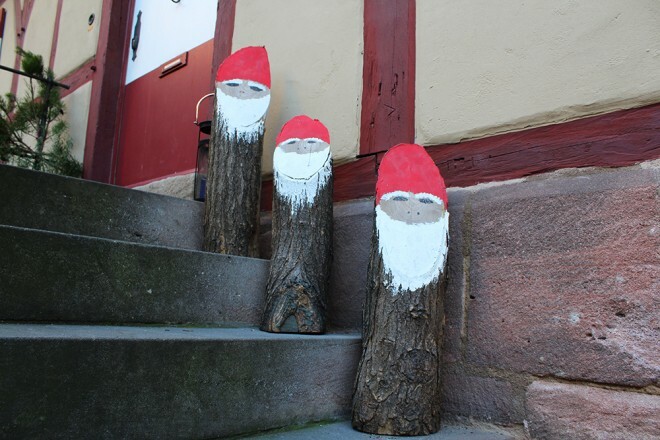 I don’t know why but this year I don’t feel very xmassy.. must be the weather. Looks like a nice market ! I know right? 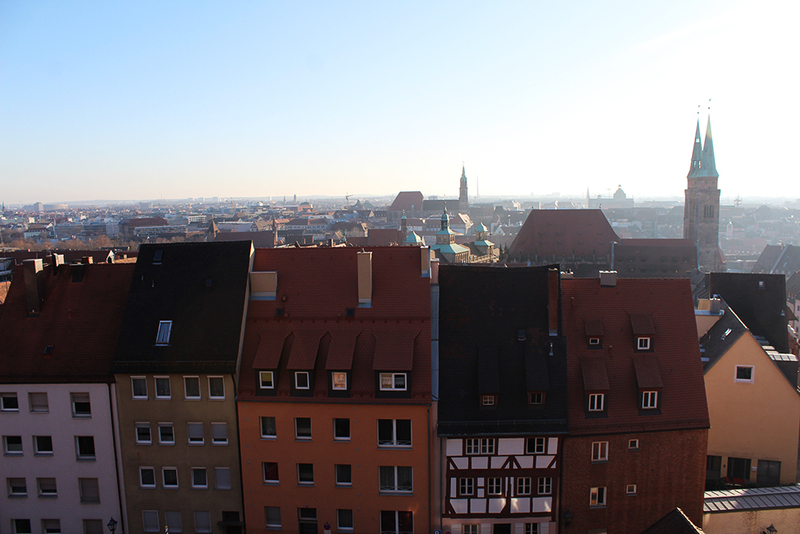 This warm weather isnt helping much, it’s actually very weird. One year ago we had sooo much snow! 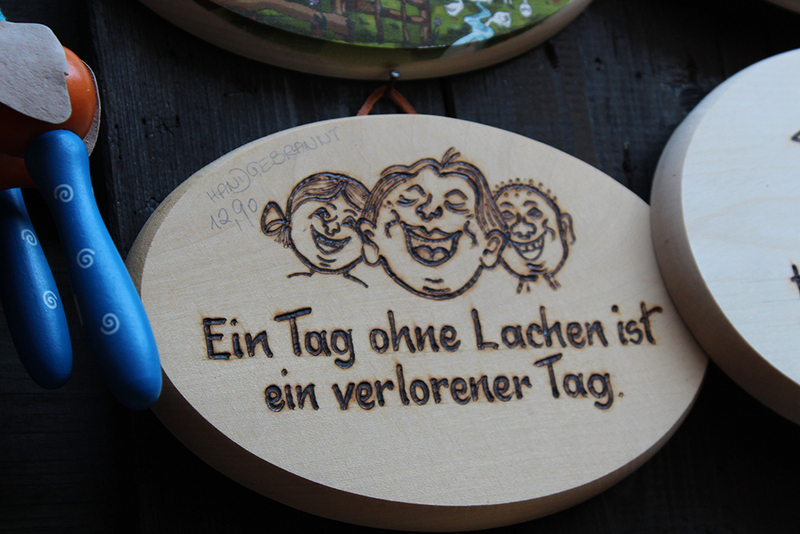 It is right? 🙁 I wish it was colder. Weird December! 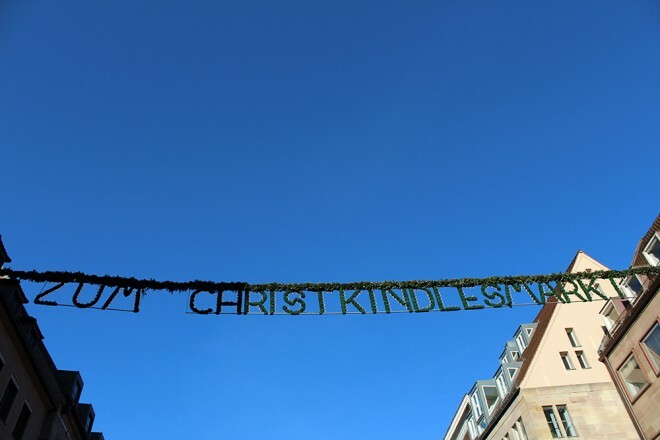 I hope next year it will be different (normal again)! Yesss, I was there until night, but it was sooo packed, almost impossible to get a good shot!